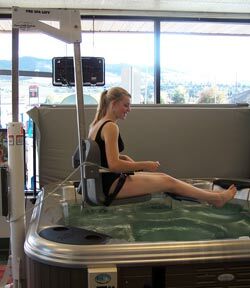 The Aqua Creek Spa Lift can provide you individual freedom to access your hot tub so that you too can enjoy the many physical, mental and even social benefits of the warm water and therapeutic jets of a back yard hot tub. The Aqua Creek Spa Lift is designed to provide access to on ground pools and spas with wall heights from 20 to 48 inches and wall thicknesses up to 14 inches! The lift features a full 360 degree manual rotation so that you can access your hot tub from any direction and is shipped fully assembled making installation a breeze. The Aqua Creek Spa Lift is constructed of stainless steel and protected with a durable and attractive white powder coat finish that goes with any decor. Lift includes battery, wall mount charger, hand-held controller and anchor system. Field measurements are required. Features include...360 degree manual rotation, Clears a 40-inch high by 14-inch wide wall (101 by 35cm) 400lb (181kg) lifting capacity, Rechargeable 24-volt battery operation, Stainless Steel Construction, Durable epoxy powder coated finish, Dual flip up arm rests, Submersible remote control, Pull out, Adjustable lap belt, Concrete embedded anchor system, Wall mounted battery charger, Five year warranty, Ships fully assembled via common carrier, Approximate shipping weight is 295 pounds.